Forum Index > Historical Arms Talk > Were early handguns considered short ranged weapons? Posted: Fri 02 Dec, 2016 11:51 pm Post subject: Were early handguns considered short ranged weapons? I often hear it claimed that early handgonnes could only be used at a super short range due to their inaccuracy, but is this really backed up by primary sources? In the 16th century there are plenty of sources that considered muskets superior to bows because a bullet would fly much farther than an arrow, wouldn't that also be true of earlier firearms? I would think that in an era where "range" is mainly determined by how far the weapon can shoot, the ability to send a bullet whistling past enemy troops' heads from an very far distance would be pretty terrifying. And if anything, a heavier bullet traveling at a much lower velocity should theoretically be affected less by the magnus effect than a musket ball. I think even early handguns technically had a much great range than bows. However I think there are other factors that decide the effective range of a certain weapon. One of these is the inherent inaccuracy of handguns, as well as the crude aiming methods. The other one, which I think is a big factor, is that you can't see the projectile of guns while you can see arrows as they fly though the air. When you can see where your projectile lands you can compensate your aim accordingly, I believe even modern snipers use this method. So a well trained group of archers would be able to direct arrow volleys relatively accurately up to 200 yards or more. However with handguns is difficult to see where the bullet lands, and since they took such a long time to reload, I would think that gunners would be more conservative with their shots and wait till the enemy was close so they could use their guns to the greatest effect. That's just my uneducated opinion. Early handgonnes are generally depicted/illuminated in the context of siege warfare. I would first define between handgonnes and matchlocks. The matchlocks only starting to enter popularity in the early 15th century.. It was still then a matter of a couple of centuries before matchlocks became a predominate force for artillery, vs archers. So, long understanding short, handheld firearms were generally regarded as shorter range effectiveness (even up to the late 19th century). While there might certainly have been early "sharpshooters", one must first accept the numbers of firearms available and their deployment. I once managed to miss a refrigerator at 20 feet with a wheel lock pistol. For accurate single shots I'd go a with a bow every time. As previously mentioned, aimed fire was not a common aspect of warfare until the 19th century. Of course we can find period examples but on a whole the idea was to get as much lead in the air as possible and let fate decide who gets hit. Even with archery in medieval warfare the idea was not aimed but mass volley fire. Why should we think otherwise when it comes to firearms technology? We all have have personal anecdotes about accomplished or failures at accuracy with period weaponry but I would suggest that we are speaking from a modern mindset when it comes to range weaponry and how it is affected by accuracy. Being able to loose three shots quickly into a massed body of troops is much more effective than being able to make one aimed shot every two minutes. I will note that this is for *military* weapons. Hunting has always been another matter, especially in the blackpowder era when you could only count on getting one shot on target, and the most accurate firearms of the early gunpowder period were hunting weapons... which of course were generally too high-class and finely made to be mass produced, as far as mass production was a thing back in the day. This was true even as late as the early 1800's, with Kentucky rifles and such being used as sniper weapons-- aimed, precise fire on single targets by highly skilled shooters. Which handguns? By the 15th century we'd be seeing a large variety of firearms from the simplest pipe-guns that still had to be ignited with a linstock to early serpentine locks that could be aimed and fired much like a modern long firearm. Their accuracy would have varied greatly too; the factors at play included the ratio between barrel length to bore diameter (the early pipe handguns were usually shorter in this regard, giving lower muzzle velocity and thus greater bullet drop over distance, which complicates aiming), trigger/ignition type (the ones that had to be lit with a linstock were obviously more difficult to aim since the barrel could not be easily brought to eye level in the manner of serpentines and later matchlock that could be held with both hands on the stock), windage (since individual shooters might have had different preference in terms of a tighter ball for better accuracy vs. a looser one for faster reloading), gunpowder quality and so on. The evidence shows that at least some guns could be aimed effectively even at such an early date. There was a renowned sniper named Jehan de Montesiler during the Hundred Years' War (maybe even during the siege of Orleans that brought Joan of Arc to fame?) who could accurately hit individual targets across the distance between the city walls and the English siege castles, which would probably have been somewhere between 50 to 200 meters. One thing commonly mentioned in testimonies about him is that he could pick off the English from beyond the effective range of their arrows (presumably meaning the range of individual aimed shots with the longbow). This is no mean feat with an early smoothbore weapon. Neither was massed fire necessarily the rule before the widespread adoption of Minie rifles in the mid-19th century. It should be noted that many early firearm units (often intermixed with crossbowmen) were deployed as skirmishers rather than as massed missile blocks. Skirmishers would have had a far lower volume of fire and thus much more need for at least some accuracy to make sure that their shots weren't just making a great deal of noise with very little impact upon the enemy's morale. Even in modern armies, suppressive fire must be aimed to some degree since it must be accurate enough to make the enemy genuinely believe that they could be hit if they broke cover. The same would probably have applied to late medieval and Renaissance warfare. Another piece of evidence is that military memoirs from the 16th and 17th century frequently mention aiming instructions, especially "aim for the shoelaces" in the English Civil War. While this did not necessarily mean taking precise aim at individual target, it clearly shows that aiming a gun wasn't simply a matter of pointing it in the general direction of the enemy. Last but not least, one thing that has been cited in favour of the idea that "musketeers/firelocks didn't aim" is that 18th-century muskets like the Brown Bess often had no sights at all or at most just a rudimentary post front sight. But this immediately falls down when we look at earlier firearms, especially from before the 1660s or 1680s or so. Many of them -- including ordinary matchlock muskets, calivers, and arquebuses issued to run-of-the-mill soldiers rather than hunters, nobles, or specialised marksmen units -- had both rear and front sights! Admittedly, these sights were rudimentary and non-adjustable, perhaps more comparable to the sights on modern compact and subcompact handguns than those on modern rifles, but the fact that there was a rear sight meant that soldiers could be regularly expected to line the sights up for at least some pretension for accuracy. It should also be noted that the matchlock is inherently slower than the flintlock; a typical soldier could achieve four or five rounds per minute on a regular basis with a flintlock given the proper training, but a matchlock would have been hard pressed to fire more than three rounds a minute, and the evidence from memoirs and manuals indicate that the actual rate of fire was often lower than this (often as low as two rounds per three minutes -- yes, less than one round per minute!). With a lower volume of fire, it made sense that there would have been a greater focus on aiming well and making every shot count. The problem with what you have here Lafayette is that your examples are all anecdotal not showing larger patterns. Everything I have seen indicates that for the most part these are up close sort of things early on. And I suspect crossbows mixed units were more for massed fire as well so this is hardly a smoking gun.... pun certainly intended. I think it is likely you have your good gunners. Guys like Mr. Curtis brings up. I have little doubt. Is it easier to aim than other weapons. I do not know. I suspect with the right gun as brought up before and the right training you'd get pretty good. To me there is much that puts this down. First. Many of the gunners seem to be almost levied men if not purely levied men. We see them being provided with guns by towns and cities. How familiar are these men with these weapons. They could be very well trained or abysmal. Totally depends on the person and local provisions for this. I'd also suspect this means they likely are less familiar with the gun if they are getting them before the campaign or the battle starts. So just like any weapon the soldier is a huge part of this. This would include the largest groups of gunners I know raised in the 15th and 16th century so I am skeptical of the idea of massed forces of well trained gunners with state of the art guns. Most in art seem to show average Joe being told to go fight and being given a rather simple or old handgun of the pipegun variety by the mid to late 15th. Second is very much the gun. Shorter barrels have a harder time with aim. Just simple laws of physics involved here when assessing the powder and barrel. This is what for my discounts much modern testing. Using modern powder is almost as bad as using a 19th century musket to prove medieval guns could do X, Y and Z. By the late 15th you have some great improvements, longer barrels, triggers, and even rifling (though seems to be rather limited to small use and very wealthy). I think also it is less likely that you have as well trained gunners than crossbowmen and archers in many places for some time as such things take time to build up skills as part of sort of a larger consciousness. Things improve often in use. If you have 60 guys over a year using them it will not have the trail and error needed that hundreds of years with who knows the 10,000s or 100,000s will. I look at the 2nd quarter of the 14th well into the 15th like this. With increasing use the improvements will be made that make a superior weapon but also allow for a tradition of using firearms such as other weapons had in the past. The problem with what you have here Lafayette is that your examples are all anecdotal not showing larger patterns. Everything I have seen indicates that for the most part these are up close sort of things early on. But what have you seen exactly? Are there 15th century sources that say "crossbowmen can start shooting from 300 yards away but handgunners need to wait until they come within 10 yards to start shooting"? What I was trying to get at is that while musket tactics eventually settled down and focused almost entirely on short range volleys, in the 16th century there seems to be mixed accounts. During the longbow vs gun debate some like Roger Williams considered muskets superior in part because they could kill men and horses at 600 yards while longbows couldn't. Blaise de Monluc similarly found longbowmen unimpressive around Boulogne because they had "weapons of little reach" compared to the French arquebusiers. During the Japanese invasions of Korea, Yu Songyong wrote that the japanese firearms were disheartening because they could shoot "several hundred paces" and mentioned instances where the koreans were suffering casualties to bullets at ranges where all their arrows fell short. All of these seem to indicate that the chief comparison was maximum range rather than "accurate range". So wouldn't the same be true of simpler hand cannons? In many cases wouldn't a 15th century lord be more interested in the fact that a handgunner can fire his weapon into the air and cause a puff of dust to appear half a mile away than whether or not he can hit a bullseye at that distance? I know many modern books like to claim that early firearms were extremely short ranged weapons, but I'm wondering if whether that opinion is really based on contemporary opinions, or whether it's assumed based on comparing the weapons to later firearms. Interesting info thanks. 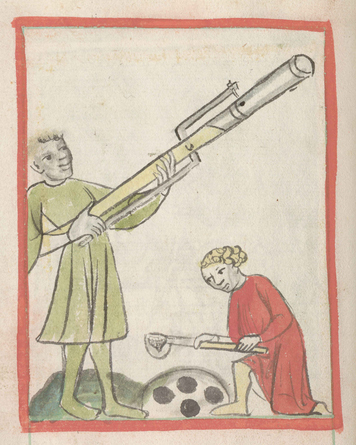 There was definitely quite a lot of variation among 15th century and even 16th century firearms, which makes it kind of hard to draw concrete conclusions. I seem to recall Bert S. Hall's book arguing that wall guns similar in caliber and length to a Spanish musket had existed for almost a century prior to 1521.
although the ones I saw in Sweden seemed more pronounced. In either case they're pretty subtle and hard to spot in picures unless you are looking at the gun in person. If you expect to find ranges in medieval sources of that nature you will be sadly disappointed I suspect. I have been. I have read who knows how many medieval documents in several languages and to my recollection there is nothing like that. They tend to use ambiguous statements like 'an arrow's shot'. That said we know that this is likely 200 plus yards so the Korean account does not sound so impressive in an of itself unless their east Asian bows are less able to loose arrows a good distance, which I do not think it true. It could be the type of wounds at such distances as I think it very likely that the bullet would still have far more energy than an arrow at those ranges but once again what evidence is there these are aimed shot? There was an article on the wounds from firearms I think it was called ‘What Earthly Reason? Bows and Guns. A good read and gives some interesting ideas on the lethality of them. The problem is that we have such documents from the 16th and 17th century at least and I highly doubt they would be moving in their distance with better guns that had longer barrels, unless it was trail and error that showed it was ineffective ultimately, so they dropped the opening discharge. The debate of the 16th century is dangerous. Both sides have their horse in the race, some tied to making money off their horse so one needs to be careful. I can think of nothing off the top of my head that shows a tactical focus on long range shooting for guns of the 15th or 16th centuries. In part because they are in low numbers and often mixed with other units in the 15th century. I think guns could shoot further but if not accurate and outside volley to what end. You are likely not to hit anything. As well the further the target is the more chance of the bullets going far off to right or left field at which point the process of discharging the weapon becomes useless or of less effect if you have 2000 men and 1/4 or more fly off away with no impact. With limited ability to make more bullets on the field and for the 15th more important cost of powder this would be like shooting arrows or anything off at too extreme a distance the cost ratio is just not worth the damage it does. Under the right circumstance you could kill someone but it would be better to wait for them to get closer and get a much better statistical chance of hitting them. I think this was the way of it with bows and crossbows as well. I think they waited to certain ranges to begin their attack to be as effective as possible not hope they get lucky. "All of these seem to indicate that the chief comparison was maximum range rather than "accurate range". So wouldn't the same be true of simpler hand cannons? In many cases wouldn't a 15th century lord be more interested in the fact that a handgunner can fire his weapon into the air and cause a puff of dust to appear half a mile away than whether or not he can hit a bullseye at that distance? " Perhaps in asia but not in Europe. Though one account stating that as above is not really solid evidence. It'd be better if we had clear ones like later period black powder tacticians give. I know of nothing that supports what you are saying as far as tactics. I think we are missing the biggest advantage of missile weapons with guns. Guns have a much more powerful capacity than any other weapon of their day and it was just starting. It would be hard to stop with most armour and at close ranges you have a good chance of penetrating the best soldiers armour on the field. So if your longbow or crossbow has a 10% chance of killing a man at X distance and the gun a 50% chance at X distance and is cheaper and simpler to use that is a heck of an advantage. Take a look at Alan Williams Knight and the Blast Furnace. He has some info there. There are some issues but it is one of the best quick looks at armours durability and hence energy of crossbows, bows and guns. If you really want a good run through of early firearms you really need to find Bert Hall's Renaissance Warfare. There is not a book that to me is better and sadly there are tons that are awful and full of modern tests using poor representations of older firearms. His books is hands down the best I know of to this date. The Koreans had a fairly strong archery tradition at the time of the invasions, and Yu Songyong does seem to have been talking about ranges where the arrows physically would not reach. Quoting from The Gunpowder Age "When our soldiers are lined up against the enemy ranks, our arrows do not reach the enemy while their musket balls rain down upon us." Experiments during the Napoleonic era concluded that musket volleys under perfect conditions could inflict 5-10% casualties on a battalion sized target, so this may have been possible. During most of the early modern era accuracy tended to be limited more by the quality of the troops than technology. A high-velocity bullet will blow a hole in someone's chest at 10 yards, sure. But even at terminal velocity a bullet is still going to injure and possibly even kill similar to a lead glandes. Especially if it is relatively large, retaining more momentum (and some early gonnes certainly straddled the line between handgun and small cannon). If anything, for a short-barreled handgonne with a subsonic muzzle velocity the difference between muzzle energy and terminal energy would be far less impressive than for a long-barreled musket. Later manuals tend to prefer engaging at relatively short ranges and even then it varies, some 17th manuals say open fire at 240 yards, and some later manuals recommend opening fire 40 yards, but that doesn't mean firearms were getting less effective. Prior to these sorts of professional manuals though I don't think we can just assume that close range volleys would be intuitively considered the best tactic with early firearms. Blaise de Monluc is a bit unclear about what he considers bow range and arquebus range, but during one skirmish with the English archers he mentions that he came up with the idea to specifically order his arquebusiers to hold their fire until the english came close enough to draw their bows so their initial volley would be more effective. You misunderstand me. I am not saying that the only explanation for shorter range fire is less effective firearms. What I am saying is that we know guns of the say 17th century were more effective than those of the 15th. I've used replicas of both and there are simply major limitations to earlier designs. If they had a tradition of long range fire why would they purposely drop it. You only have so many options then. To me it is closer fire was more effective at incurring casualties or that the tech was decreasing. I am sure there are a few more but those are the only two I can see. Costs and limits to ammunition and powder likely play a part of this previous example as well. You get more bang for your buck. I also think there is evidence for other earlier weapons being used in this means with starting with longer distance missiles then waiting for closer targets to unleash more of a full strength. Even with these this is hard to prove and we have tons of accounts more than firearms. The wording is usually just too open. I think though the main idea that because they could shoot further than other missile weapons has far less support than the simple power and damage of these early firearms to other weapons. Take a look at the first article I posted but you can see the damage is what is brought up over and over. These were incredibly more powerful than their competition. To me this is really it. That and they were in their infancy. They had much more area to go and develop whereas crossbows and bows were really at a technological ceiling for their day, guns it was upwards and onwards. I think there is no question the mechanical properties are there for firearms shooting further but finding evidence for this in the 15th is the ticket. I just do not see it. In the Korean account I'd have to see the entire text to get an idea of this. Who is the one who wrote the Gunpowder age? Andrade? I have seen a few of his works before. Not convinced from anything of his I have seen this is the case regarding distance. I'll look into his book though. Nor if saying because a tactic was used in the east it means the west had the same. He has an earlier article I think from last year that covers some interesting points. Even with things like the cannon I think it is about simple power why it replaces the earlier weapons. You are talking about something like 300-400 J of energy for a massive crossbow of 1200lb draw to early large personal firearms that were doing easily four to five times that. Even if the effective distance is close to the same that is a huge increase in power that undoubtable increased the viability of the weapon to cause casualties. If you have not seen the Great Crossbow and SPringalds by Jean Liebel take a look at it for some comparisons of crossbow energy and such. To me the battlefield is for sure divided into effective targeting ranges. Finding these is complex at best for any of these weapons. Doing a comparison moreso as I doubt the textual evidence exisits and there are plenty of negative qualities each has to compensate. That is why people around the globe still use bows and arrows, crossbows and bolts alongside guns for so long. To me the battlefield is for sure divided into effective targeting ranges. Finding these is complex at best for any of these weapons. Doing a comparison more so as I doubt the textual evidence exists and there are plenty of negative qualities each has to compensate. That is why people around the globe still use bows and arrows, crossbows and bolts alongside guns for so long. To play devil's advocate, they could have dropped because soldiers were getting numbed to the psychological effects of getting shot at. If you used to the relatively quiet sounds of hooves, crossbows and bows and you suddenly hear thunder whizzing by you, I bet it would be extremely unnerving. If your troops and your music numbs your soldiers to the psychological effects of gunfire,that induce a change in tactics. Also, one the notable about musket balls is you could carry allot more ammunition in the same space as a quiver. I read an account by a young George Washington, during the French and Indian Wars where he described how exhilarating it is hear the sound of a bullet whizzing past him. Later on, I read a British account of how horrifying it is to have to bayonet someone,and that he screams so that he doesn't have to have hear his victim scream. Maybe earlier armies were less effected by close quarter combat by more affected by noise and sounds of guns and cannon, and later armies were numbed to gunfire and more afraid of hand to hand combat? I wonder that too. There seems to be accounts as late as the Civil War of commanders arguing that shooting from long distances actually improves enemy morale rather than hurting it. But perhaps that wasn't the case back when firearms were less familiar. I don't think it's correct to say that there was a long-range shooting tradition that died out. For starters weapons like cannons and amusetts continued to be used at very long distances. Wilhelm Miller's Elements of the Science of War in the 1810s had an interesting take on musket range. He wrote that normally musket fire should start at no farther than 200 paces and and ideally be held until 1/4th that distance. However he notes that if an attacking batallion ever does open fire at 300 or 400 paces then the defending battalion should still fire back. If it is the defending battalion that opens fire early then the attackers should deliver a volley at 300 paces then continue advancing while delivering another volley every 30 or so paces. The types of wounds they caused was definitely one of the major reasons muskets were preferred over bows. (Although I can't seem to find the article you mentioned, do you have a link?). Though many early guns seem to have been far less impressive. Alan William's estimates for a Hussite handgun get as low as 500 J. Not much more than a crossbow and with a round bullet penetration would be far worse than an arrow. However, since a supersonic musketball tends to lose most if its energy in the first 100 or 200 yards, the maximum range may not have been that much worse. The Andrade book is the one I was talking about. Chase's Firearms book has some more quotes from the same source, however he still concludes erroneously in my opinion that muskets had a worse range than bows. We're not really disagreeing here. I agree that, then as now, most shooters are crap, and that user skill generally has a greater effect upon accuracy than the weapon's own inherent accuracy (or lack thereof). However, that doesn't mean that our modern conceptions about the inaccuracy of medieval handguns isn't significantly exaggerated either. We have a pretty good modern parallel in the Kalashnikov -- it may seem inaccurate when compared to the M16 or most other modern NATO assault rifles, but a well-maintained Kalashnikov is still quite capable of outshooting most rifle designs from before the last quarter of the 19th century or so, and it still has reasonable accuracy against human-sized targets out to 200 meters or so. The biggest component in its image as an inaccurate weapon is that most users aren't trained to make the most of its accuracy. I can't help feeling that this must also apply to a large degree to all but the most primitive of medieval stick guns -- give one to a skilled modern marksman and he might be able to fire the weapon with enough accuracy (perhaps comparable to modern shotguns without chokes) to get himself burned at the stake for making a pact with the devil to shoot so accurately or something like that. On the other hand, I think one of the reasons why Europe took such a prominent place in the development and use of firearms was because early firearms meshed well with existing crossbow traditions. The way firearms were held and aimed basically mirrored contemporary crossbow-aiming practices in most cases, and it's not hard to notice the close resemblance between the long trigger used in early long-barrelled firearms (starting with the serpentine) and the trigger lever on European crossbows. I believe this significantly lowered the cost of adaptation, thus giving Europeans an incentive to hold on and keep developing their firearms despite all of the weapon's early disadvantages until they came up with the "modern" matchlock design around the end of the 15th century -- at which point firearms became sufficiently easy to use that other cultures then had the incentive to adopt them too.